The Edgewater-New Smyrna Cemetery, also known as Hawks Park Cemetery, located at 700 South Ridgewood Avenue in Edgewater, Florida. Originally named Hawks Park Cemetery, the graveyard was established in 1890 and is located near the historic downtown district of New Smyrna. Hawks Park was a community founded by Dr. John M. Hawks, the author of The East Coast of Florida (1887), around 1872. The name was changed to Edgewater on October 24, 1924, by an act of the Florida Legislature. William Henry Coe (1824-1879), the founder of Glencoe, and his son, Captain Charles Henry Coe (1856-1954), founder of The Florida Star and author of Red Patriots: The Story of the Seminoles (1898), are buried in this cemetery. Original color digital image by Robert Redd, 2015: Private Collection of Andrew M. Foster. Originally created by Robert Redd. "Welcome to Edgewater-New Smyrna Cemetery in Edgewater, Florida: About Edgewater-New Smyrna Cemetery." burialplanning.com. http://www.burialplanning.com/cemeteries/edgewater-new-smyrna-cemetery/cemetery-about/. "City of Edgewater." Florida League of Cities, Inc. http://www.floridaleagueofcities.com/Directory.aspx?iID=214. Redd, Robert. 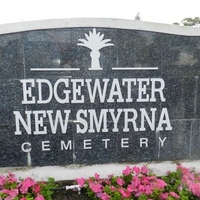 “Edgewater-New Smyrna Cemetery.” RICHES of Central Florida accessed April 20, 2019, https://richesmi.cah.ucf.edu/omeka/items/show/6179.